Azure Functions is a solution for easily executing small fragments of code or “functions” in the cloud. It takes the basic concepts of the already known WebJobs and develops them in interesting ways. 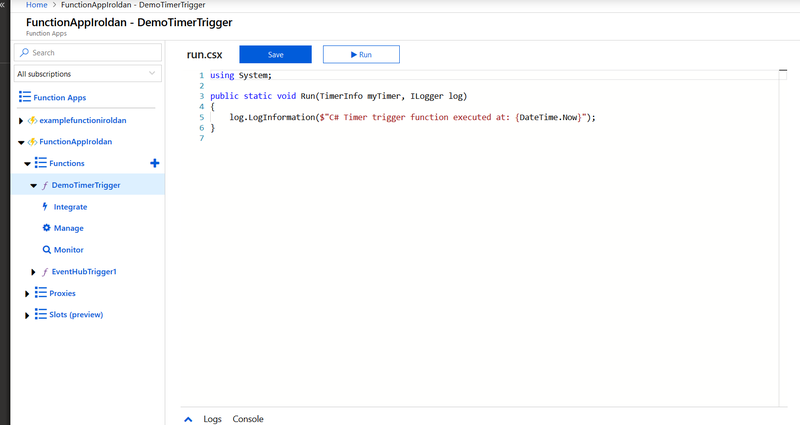 Azure Functions presents us with a host of new triggers to be able to run it. These triggers include: Cosmos DB, Event Hub and WebHooks. We can code everything we need for the problem/action that we want to execute without worrying about the app or the infrastructure. It makes development more productive. Change in the payment model regarding WebJobs. Azure Functions has two payment models, as well as it being able to be included in an existing payment model as an App Service. You can also pay only for the time that this function is running. We can code in different programming languages, like C#, F#, Node.js, Java or PHP. It allows us to develop serverless applications in Microsoft Azure. Only pay for the time that Azure Functions is running. Recognises both Nuget and NPM. Allows you to code in both the Azure portal as well as in our application and then integrate it configuring continuous integration in Azure. BlobTrigger: We run the function when we add new blobs to the Azure Storage containers. QueueTrigger: We run the code of a function as they arrive at an Azure Storage queue. EventHubTrigger: Responds to events in Azure Event Hub. 1. We enter the Azure Portal https://account.windowsazure.de/Home/Index and log in. This is the dashboard you’ll see once you have logged in: 2. Choose the option “Create a resource” and a browser will appear in which we will put “Function App”, where we select the option that is marked in the image. App name: Name of App Function. Subscription: Subscription to which our Azure account is associated. Resource group: groups of Azure resources, we can create a new one or use one that already exists. Hosting Plan: We can select the payment model when the Azure Function is running, or rather use a payment plan that already exists in an already created App service. Location: Location of App Function. Storage: Container that uses Azure Functions. We can create a new one or use an already existing one. Name of the App Function that we have previously created. Button for creating a new Azure Function. All the triggers that we have for creating our Azure Function. This will execute the code of our function every minute, in this case it will show us in the log of the function day and the time at the moment that the function has been executed. To sum up, Azure Functions offers a solution that allows us to manage operations on a large scale at a low cost, and I am therefore completely convinced that it will soon substitute the traditional storage methods, since the non-intervention management approach reduces the demands of operations, while keeping costs low.